Voters in North Carolina’s 9th Congressional district have a clear choice this November. That choice is between prosperity and progress or obstruction and hardship, and it comes in the form of two very different candidates. On the one hand, they can vote for Republican Mark Harris, who will support President Trump’s bold agenda that’s bringing real economic progress to the state. Or they can vote for Democrat Dan McCready, who will act as a rubber stamp for the Democrats’ obstructionist agenda. Thanks to the President’s vision, North Carolinians have new jobs and more take-home pay. This is the kind of change that means everything to working families, single moms, and young people entering the workforce for the first time. In fact, President Trump has done more for North Carolina than any president in recent history, and the evidence can be seen — and felt — all across the state. North Carolina is now surpassing expectations, reaching new milestones, and climbing the ranks of the most pro-business, pro-worker states in the country. Under President Trump, for instance, the state is among the top 20 states with the highest increase in GDP growth, and touts its lowest unemployment rate since 2000. The Tax Cuts and Jobs Act is delivering on its promise of record-breaking growth. According to labor statistics, North Carolina added 13,000 new jobs in July alone. And thanks to lower rates for individuals and small businesses under the new tax code, NorthCarolinians are keeping more of their hard-earned money. While North Carolina’s economic comeback is a direct result of President Trump’s bold agenda, it wouldn’t have been possible without congressional Republicans, who voted in favor of President Trump’s historic tax cuts and deregulation that’s delivering relief to small businesses throughout the state. That’s why this year’s elections are so important. The continued growth of North Carolina won’t be possible under Democrat politicians who opposed it from the start. Everything that President Trump has achieved with his economic policies can be wiped away if Democrats take over the majority in Congress and derail his pro-growth agenda. 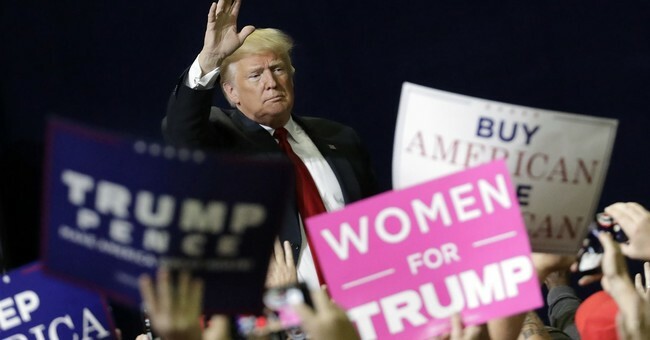 North Carolinians made it clear where they stood on the need for pro-growth policies when the state favored Donald Trump in 2016 over his Democrat opponent Hillary Clinton 50-46 percent. If voters want to see a brighter economic future, they should support Mark Harris, the Republican nominee for North Carolina's 9th Congressional District, who will fight for the President's agenda. Harris will help build on our booming economic growth and secure our border to help Make America Great Again. Meanwhile, the Democrat running against Harris, Dan McCready, will support the radical Schumer-Pelosi agenda. On immigration, no one in North Carolina knows where McCready stands. He’s refused to declare his support for President Trump’s immigration agenda, leaving the people in the 9th District guessing. When asked about impeachment, Team McCready dodged the question, claiming they don’t answer hypotheticals. But the question isn’t hypothetical — and Americans deserve to know if their representatives are plotting against their president. As for our economic growth, keep in mind that not one Democrat in Nancy Pelosi’s House caucus supported President Trump’s historic tax cuts, which she plans to repeal if the Democrats gain the House majority. So will McCready vote with Pelosi on taxes? A recent revelation might hold the answer to that riddle. Nancy Pelosi’s House Majority PAC, funded in part by northern California limousine liberals, spent $227,600 in political ads against Harris — the most outside spending by any group in North Carolina’s 2018 congressional races. McCready may think keeping his mouth shut may fool us into thinking that he’s a moderate, but Nancy Pelosi’s money speaks volumes. If we are to preserve the historic economic gains we’ve made under President Trump, we can’t afford to let Pelosi acolytes like Dan McCready get elected. North Carolina has come so far, and we have so much to lose if the Democrats drag us back to the failed policies of the past. Instead, we have to send Republicans like Mark Harris to Washington, so they can protect our economic progress from the Democrats’ proven track record of failure. A vote for Democrat Dan McCready, a rubber stamp for the Democrats’ obstructionist agenda, is a vote to throw away everything we have gained in the past 21 months. Let’s keep North Carolina on track for more unprecedented economic growth.